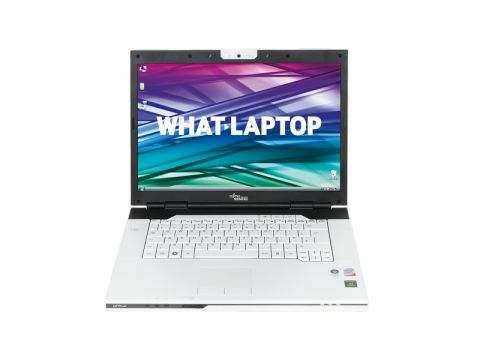 Fujitsu Siemens (FSC) has an extensive laptop range that covers business and consumer markets. The Amilo Pi 3540 (£699 inc. VAT) features a unique design, great screen and strong usability, but is let down by basic mobility and mixed performance. The white and black chassis looks great and stands out from the crowd. It quickly attracts dirt, but is easy to clean. Weighing 3.1kg, it isn't ideal for regular travel use. This is driven home by its 180-minute battery life, the minimum we expect from a modern laptop. The keyboard is great and a pleasure to use. The white keys are quickly tarnished, but usability is excellent. Hot-keys above the keyboard can also be used to instantly launch your favourite software media player and web browser. Image quality of the 15.4-inch glossy Super-TFT screen is also great, as are brightness, colour and contrast. The WXGA resolution is standard and lets you work with two or three windows open at once. The most compelling feature is the impressive 3D performance. The nVidia GPU provides enough power for mid-level gaming and multimedia use. This is where the strong performance ends, however. Despite its powerful 2.26GHz Intel Core 2 Duo processor and 3072MB of memory, home and ofﬁce tasks run slower than on all rivals in this group. Bear this in mind if you want to perform complex multi-tasking. Far more pleasing is the outstanding storage. The spacious 320GB hard drive will easily hold an entire family's data. The DVD rewriter supports all DVD/CD formats, and the 15-in-1 card reader provides compatibility for Flash storage cards. Connectivity is a mixed bag. Analogue and digital high-deﬁnition (HD) screens can be connected using the VGA and HDMI-out ports. This is the only laptop here not to feature Bluetooth for wirelessly connecting peripherals, however. An impressive software package is installed to help new users get to work straightaway. Microsoft Works provides basic ofﬁce tools, while internet security software and DVD playback and creation programs provide online protection and multimedia usability. As long as you're not looking for the most powerful laptop at this price, the FSC Amilo Pi 3540 is a great choice. It's stylish and usable, with a great screen and multimedia capabilities. Just make sure you weigh up how important performance and battery life are to you before you buy.